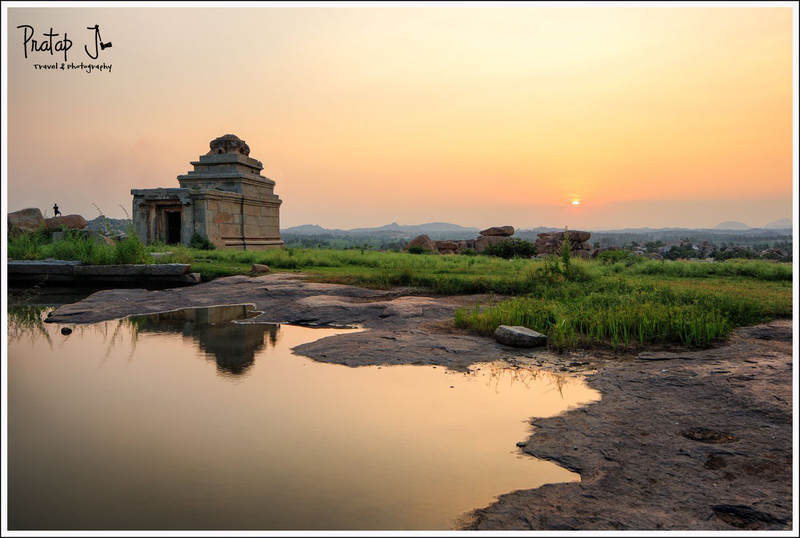 The ruins of the Vijayanagar empire are situated in the town of Hampi in Karnataka. Ancient structures, mostly in dilapidated condition, are found spread across many acres of rocky terrain. The temple of Virupaksha is the epicenter of Hampi. Close to the temple is a hillock, known as Hemakuta. Tourists visit this hillock in the evenings to see the sun set over the green fields that surround Hampi. The Tungabadra river flows to the right of Hemakuta, making the view from the hill almost fairytale-like. Remains of ancient Jain temples dot the Hemakuta hill. For a photographer, this scene is both inviting and challenging. There are so many different elements of interest on Hemakuta that you are mostly left wondering how to weave a visual story from what is around you. The sunset is definitely a golden opportunity (pun unintended) to make your photograph extra special. The photo here was planned much before we even reached Hampi. I wrote to the Archeological Survey of India (ASI) for permission to use a tripod in Hampi several weeks before the trip. I had to follow-up a few times, and finally make a personal visit to the ASI office in Kamalapura to obtain the letter permitting us to set up the tripod in the vicinity of the monuments. With so much of effort having gone in, I was under pressure to make a memorable picture that evening on Hemakuta hill. I hadn’t scouted the location beforehand, so I had literally walked into the scene that I was to photograph. This, to a landscape photographer, is equivalent to going on stage without a script. Adding to my woes were tourists who didn’t mind walking right into my frame. I did manage to get a few photographs that I am personally pleased with. This is one of them. Stumbled on to your blog while researching for a visit to Hampi in the next couple of weeks. 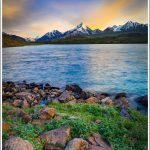 Stunning photography – I am a landscape photographer myself. I was wondering if you would share some more details on getting the tripod permit from ASI. I am currently in Bangalore. Did anyone objected to using tripod on places like Hemakuta Hill or Matanga Hill which I believe are in the open. As I understand the restriction is only while you are inside one of the ruins. Will appreciate some more light on the subject. 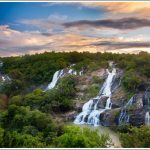 You don’t need permission to use a tripod in Matanga hill and Malyavanta hill. However, you need permission to use a tripod in other places, especially like near Virupaksha, Hemakuta Hill, Vitalla Temple etc. The ASI office is in Kamalapura, a town close to Hampi. You can contact them for permission. However it is not a very straightforward process. I suggest you don’t count on getting permission so easily! Thanks Pratap for the info. Perhaps I should forgo trying to get the permission this time around – will probably get the ball rolling by visiting the ASI office here in B’lore first but not expect anything until my next visit. Once again, congratulations on your wonderful images and great stories to go along with them to make them even more meaningful. I am going to explore your website in depth when I get some more time. Much appreciate your quick reply! Thanks for your encouragement! I did visit the ASI office in Bangalore before I was asked to go to the Kamalapura office. So unfortunately that won’t work. On my recent visit to Hampi in 2016, I did not request for any permits. The only place where I missed my tripod was in Hemakuta hill. Superb images and wonderful webpage with all your gems, had great time watching them Pratap!